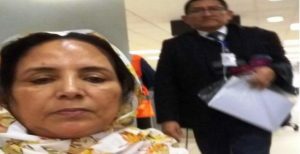 A Polisario separatist, Khadijetou El-Mokhtar, was arrested on Saturday (September 9) at Jorge Chavez airport in Lima for “usurping” the function of “ambassador” of the pseudo-Sahrawi Republic (SADR) to Peru, while she was never officially accredited by Peruvian authorities. Contrary to the allegations made by the Polisario Front, the Moroccan news portal le360.ma reported, quoting the Moroccan embassy in Lima, that Khadijetou El-Mokhtar, aka Jadiyetu, has never been approved by the Peruvian authorities as “Ambassador of the SADR” in Peru. Besides, when she landed at Lima’s Jorge Chavez airport, the Peruvian border police discovered that the so-called Sahrawi diplomat was carrying a Spanish passport and not a travel document issued by the “SADR”, a puppet entity that has never been recognized as a sovereign state by the United Nations. The international community is fully aware that this entity was created out of nothing by the late Algerian President Houari Boumediene, in complicity with the former Libyan regime of Muammar Gaddafi. Likewise, the international community knows that the Polisario Front is nothing but a separatist movement that claims, without any legitimacy, sovereignty over a part of the Moroccan Sahara. Peruvian authorities blame the so-called “SADR ambassador” for coming to Lima to “engage in political activities, in breach of the immigration laws in force in Peru.” She is also accused of “usurpation of the status of diplomatic representative” and of “interference in the internal affairs” of Peru. For the time being Khadijetou El-Mokhtar is still detained at the airport, four days after her arrest by the police. Her fate depends on the verdict of the Peruvian justice, since the decision taken against her by the Peruvian immigration authority was contested at court. The complaint was filed by Peruvian lawyer Dante Díaz Wong, mandated and paid by the Algerian embassy in Lima. If the Polisario mercenary is not prosecuted and condemned by the local justice, she should be automatically deported back to Spain, wherefrom she came to Lima.